After an ad hoc 4 days off the Cigars and all alcohol (I feel you have to do this from time to time) it was Friday and time for Lunch at Cafe Anglais just above Whiteleys in west London. I went years ago, probably 5+ years ago, and enjoyed it and as I was meeting a customer/friend who lives over that way it seemed a good opportunity to return. With Fish soup and asparagus we had a bottle of Meursault Les Gruyaches 2007, Fichet from the list. It was really very good. I love the inherent richness of Meursault with the tension of 2007. The vintage is edgy and exciting if you ask me. The producer is not one I know well but this Liet Dit site was lovely. We then had a main course of the Cafe Anglais Chicken, their signature dish, with this we finished the white and went on to have the beginning of the Tertre Roteboeuf 2006 from Francois Mitjavile’s wonderful estate. The wine looked older in colour may be 5 years older but this is often the case with Francois’ wines as he is all about the stems and pips being ripe not just the fruit. You never get a inky blue black wine. The nose was decadent and degraded, delicious, a lot of richness and weight on the palate, fun and fine now but better on it’s 10th birthday and beyond. An afternoon of finishing that and going over my fellow luncher’s cellar came after. 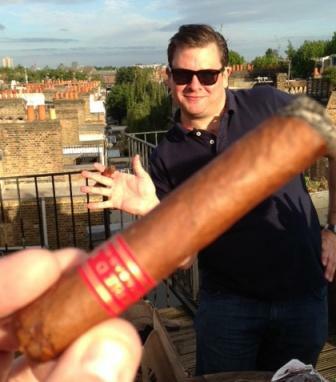 With that done it was time to head to a wine trade mate’s house in Fulham for a roof top bbq, and roof top means cigars! 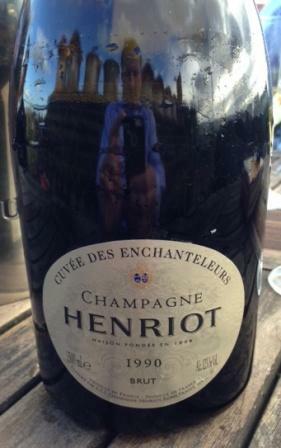 We started with a magnum of Henriot Cuvee des Enchanteleurs 1990 which was good but a little flat and had entered a very wine-like phase…a good richness and yeasty complexity. The cigars came out and I decided on a Partagas Serie D No4 (MGR May 2012), I have had one from this batch before and found it good but very youthful, almost too youthful, this one was lovely and probably all the better for being smoked slowly while chatting. It had the Partagas DNA of spice and was really balanced, I hope the “Jazz hands” in the photograph do not distract you. My white wine was out next and didn’t let me down. Wehlener Sonnenuhr Spatlese 2009 J.J.Prum in magnum, German and Alsatian magnums are a thing of considerable beauty (if a pain in the arse to chill!). This had a very slighty “reduced” nose but then started to show well. That reduction is a part of the Prum signature. If I owned more of this I would leave it at least 3-5 years even being a more open vintage like 2009. 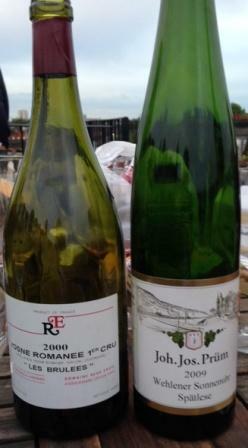 Moving on the red and a magnum of Vosne Romanee 1er Cru Les Brulees 2000, R.Engel. The nose was lovely and opened out well to give a good balance of cool red and black fruit, the palate though was a little mean and “stringy”, overall not bad but for a 1er Cru you could hope to have a bit more “lushness”. With a sadly corked bottle of Napanook behind him, “Jazz hands” dashed home (100 yards) to grab a magnum but actually got a double magnum out – Deer in Headlights 2002 Barossa Valley Shiraz by Two hands. This was arguably “wine of the night”. Full on but with loads of fruit and not lacking in freshness, it will clearly outlive most people my age! It was a perfect match for some great BBQ’d burgers, sausages and chicken. 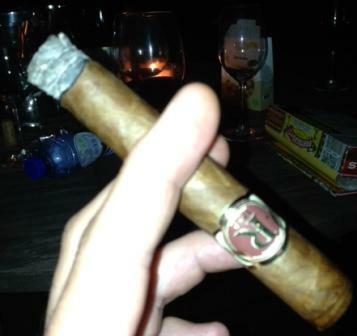 It also went rather splendidly with a post dinner cigar – Vegas Robaina Famosos (BGM Apr 2012). I have always wanted to like Vegas Robaina as a marque but until this cigar had never quite managed to “click” with them. This though was delicious, like a cigar version of a double espresso with no sugar but not bitter either. It is definitely designed to be smoked slowly with a full stomach…I was delighted to enjoy it. A cracking, relaxed evening with friends, a great way to ease into the weekend.